How to Compost. Make compost at home with composting materials from your kitchen and garden. Putting together the best composting materials. Here's how to make compost with household waste that consists of biodegradable kitchen and yard waste. Find out how to compost tons of residential trash and turn it into gardener's gold. A list of suitable compost materials answers the often asked question - what can I compost? Composting not only saves you money by providing you with a valuable by product, it saves money on trash pick up too! Not to mention the positive impact it has on our environment. Here we'll answer the question "what can I compost?" by providing information on using composting materials that get thrown into landfills every day...where, instead of having a positive environmental influence, they're trapped in plastic bags that have a very negative impact on the planet. Read on for information about essential compost materials and extras that can be added to a well balanced mixture. There's a little more to how to make compost... but not much. Start with a ratio of 6 parts brown to 1 part green then check in 24 hours to see if it's heating up. Green leaves, peelings, grass clippings any plant material that is green and moist fills this need. The green component helps maintain the required moisture level. Also, green composting materials help the pile to heat up to the desired levels. In essence you're "cooking up a batch" of compost. What can I compost to fulfill the brown component? The brown stuff is dry biodegradable waste. Most of your pile should be composed of the brown stuff. Wood chips and shavings, hay, straw, dead leaves and twigs are all acceptable as brown materials. Sometimes the mixture is too dry to properly decay. 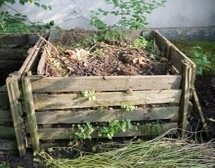 Usually the green ingredients contribute enough moisture to keep the composting materials damp but occasionally, the addition of a little water is needed. If your composting materials are not reaching the desired temperature add more green or sprinkle with water. Ideally your mixture will be of a consistency that will hold together when you squeeze a handful in your fist but will not produce droplets of moisture. Turning your compost materials adds oxygen to the mixture. Choose a composter that allows you to turn your concoction with a pitchfork or that is designed to tumble the compost. More about composters. Your compost will benefit from the introduction of soil or compost. We layer our compost materials with a few shovels full of our previous batch of compost or plain garden soil. Coffee grounds, tea bags, coffee filters, eggshells (we crush them for speedy break down), paper towels and newsprint can be added in moderation to an otherwise well balanced mixture. For the most part, a compost heap takes care of itself with little help from you. Two things you need to keep an eye on are, temperature and aroma. Temperature - A compost heap should begin to heat up within 24 hours and reach temperatures of 150 to 160 degrees F. Compost thermometers help to determine that your concoction has reached the desired temperature. Aroma - A healthy compost mixture should have no odour at all. An ammonia like smell coming from your composting materials means it's too wet. Add more brown ingredients. Avoid - Glossy papers, meat/fat and bones, dairy products, human and pet waste (waste from carnivores and omnivores). These do not make good composting materials either because they don't break down properly or because they attract unwanted pests. Also, refrain from including materials that have recently had chemicals (pesticides, herbicides and the like) applied to them. Preparation - Cutting your compost materials ensures even decay in your pile. A machete or shovel blade can be used to chop pieces into a relatively uniform size. Use a lawnmower to chop leaves (if you have a bagger use it to collect the leaves then transfer them to the pile). Corn cobs, roots and other dense materials will break down more quickly if they're cut into pieces. There are lots of great composters on the market that range in price from $50.00 US to several hundred dollars although almost any container can be used. then came the age of the plastic bag. The cheapest composter I've used was similar to the one pictured above. Made from slats of wood with gaps between them to allow lots of air circulation, these composters take a little longer to produce than some of the ready made composters. The open top allows for easy turning of the contents. Truthfully you don't need a composter at all. Designate a corner of the yard as the compost heap and just pile your compost materials there. Also, it's best to have 2 compost piles. One is the active pile and the other is resting or "cooking". The active pile is regularly receiving new material from your kitchen or yard. The cooking pile is no longer receiving new material. It's aging into a finished product. Once the "cooking" pile is done, the compost is sifted through a screen to harvest the useable compost. The large pieces that are strained out can be placed back into the active pile - which now becomes the "cooking" pile. Start the process over. When the compost is removed from the finished pile, that spot now becomes the active pile where you'll start putting your composting materials and the old active pile will be maintained as the "cooking" pile and allowed to "finish" without new materials being added. Finished compost can be used as mulch in containers and garden areas or simply placed in an area until you're ready to use it. Learning how to make compost from materials that were meant to be recycled back into the environment is very simple. The materials know how to compost themselves. All you need to do is put them together, turn the pile every few days and monitor temperature and moisture level.